Application date: May 3, 2018. Application timing: Feekes 10.5.1. Photos taken 29 days after application. University of Tennessee plot F201. Jackson, TN 2018. Fusarium head blight (scab) severity varied across the region last year. While most areas in the Southeast saw little to no head scab, some areas in the Mid-Atlantic saw severe cases of head scab, making it important to be prepared for whatever conditions may arise. Many growers who experienced severe head scab saw decreased yield and increased Deoxynivalenol (DON). University experts and reports provided to the U.S. Wheat and Barley Scab Initiative (USWBSI) show how the East coast was affected by head scab last season. MD was hit severely by head scab last year due to warm temperatures and excessive rain. Some areas of the state saw DON levels exceed 8 ppm, and many growers had to sell their wheat discounted. The rest of the Southeast saw minimal head scab infections, with only one confirmed case in GA.
As 2019 planning kicks off, we suggest trying a fungicide that can give you more time to properly manage head scab and enable protection when and if head scab strikes. 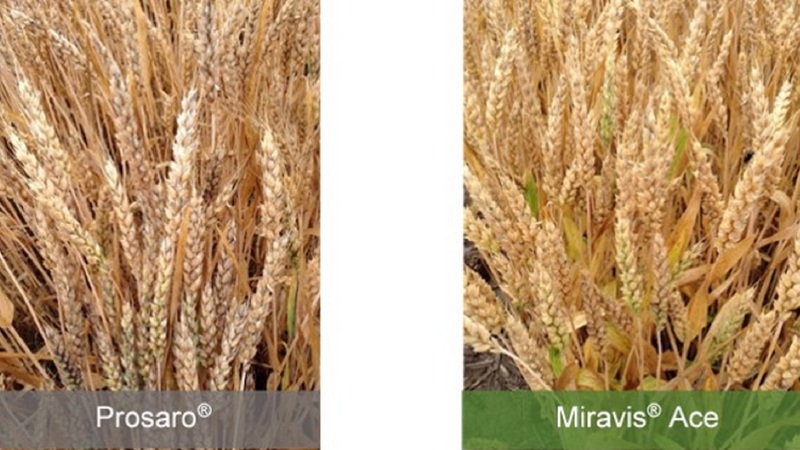 The first-of-its-kind, Miravis® Ace fungicide allows you to spray as early as 50% head emergence through flowering, giving you more time to spray for head scab and protect both the main head and tillers. Powered by the active ingredient Adepidyn® fungicide, which is the first and only molecule with an SDHI mode of action available for head scab control, and propiconazole, you can be confident your wheat is protected. Take the pressure out of head scab management in 2019 and give yourself more time with this game-changing fungicide.